Being on a budget of any kind is tough. Don’t let anyone fool you – EVERYONE is on a budget and whether it is smaller or larger in dollar value, there is an amount that everyone must stay within. 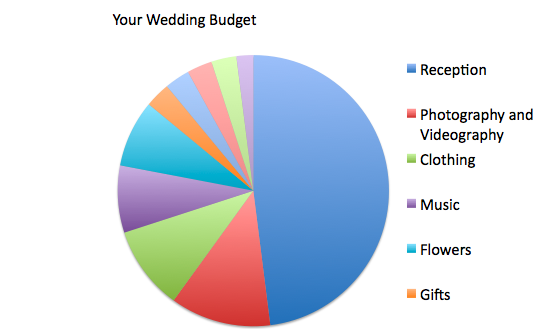 The budget for your wedding is no different, it is just a little trickier. Decide on the total dollar value you are able to spend on your wedding, and divide the finances as follows, using your preferred wedding budget template. Using a template or specific program is a must – and there are dozens available on the internet! 40 Percent – Estimate to spend 40 percent of a budget on the reception venue. This includes food, beverages, staffing, taxes and tip. 10 Percent – Ambiance. Flowers, lighting, decorations will add up quickly. 10 Percent – Music for reception; band, DJ or both. 10 Percent – Photography for the entire event. If you plan a photobooth, include it in this category. 10 Percent – Attire. Brides entire ensemble (headpiece, veil accessories, shoes), groom’s entire ensemble – head to toe. 3 Percent – Favors and gifts for guests, including all attendants’ gifts. 3 Percent – Ceremony. This includes marriage license, ceremony flowers, officiant fee, musicians (different from reception music). This is it’s own category! 3 Percent – Invitations, save-the-date cards, table markers, guest book, place cards, gift card holder, pen that guests will use to sign the guest book, programs… are all included in this category. 3 Percent – Sweets. Cake, sweet table, individual cakes or desserts. 1 Percent – Transportation costs, bus, limousine, however you plan to get your party from point A to point B (here’s to find out more). The last 7 percent is for ICE. No, not frozen water… In Case of Emergency. Use this money if something suddenly happens and the cost of one of your categories increases. You fell in love with gown slightly out of your price range, there is an unexpected surcharge or corkage fee or cutting fee. Having an emergency fund will save you a lot of aggravation. It is important to remember that every couple’s budget may vary depending on their vendor preferences and that each couple may have different priorities when it comes to their wedding. You can set yours accordingly, borrowing a percent from one category to make up in an other. However, there is only 100% so, make sure your figures add up!!! You have been asked to ‘stand up’ for a wedding and you are really excited to share the joy of your friend’s big day! Standing up refers to literally standing up during the ceremony, at the altar, to be a witness to the marriage. It is also an indication of the closeness of your relationship to one or both of the people getting married. Make no mistake – it is an honor and you should treat it as such. It is not considered good manners to rock the boat, whether it is bridesmaid gowns, the bridal shower, or the bachelorette party so speak up before you agree to stand up. But, what do you do when the cost of being a friend exceeds your ability to hold up your end of the bargain? Should you pay for the ultra expensive bridesmaid dress or make your car payment? When someone asks you to be an attendant at their wedding, they are asking you to agree to the expenses associated with that job. However, there should be limits… and just like the wedding, a budget. Since everyone has different financial situations, it is up to the individual to voice their concerns before it becomes a stress-filled rant. You can spend lavishly on your wedding and contact loan offering companies such as wowloans using their website to procure additional finances for a new car. Step 1 – Have a private conversation with the bride the day they ask you to be a part of their wedding, asking what costs are anticipated. Gown, shoes, shower, bachelorette party, and more. For every expense you anticipate, there will be something you forget so it is best to make a list of the anticipated expenses and don’t forget alterations. Ask right then and there what the bride will be providing. Is the bride treating everyone to hair and makeup or will they share that expense with you? Will you need specific jewelry or shoes? These are things that you need to be honest about on that day so you can agree or tactfully decline due to financial hardships. Being honest will help a great deal. Step 2- When gown shopping, be honest with the consultant about your financial constraints. It is probably not a good idea to shout ” That’s too expensive for me!” in themiddle of a salon. However, if one of the other bridesmaids has her heart set on a $400 gown and you simply cannot afford it, take the bride aside and quietly explain that it is out of your price range. Make sure that you stay within that price range and don’t get overwhelmed or pressured into buying something you will later regret. Ask about alteration costs, ask about tax and shipping or any other charges that will be added. Step 3 – Stay on top of the bachelorette activities. If a $900 hotel suite is out of your budget, speak up. Just say this “I’m sorry, this is out of my budget.” It really is that simple. If the maid of honor is also a good friend, she will understand. If she doesn’t budge, try talking to the other bridesmaids to see if they have similar concerns. If so, you can approach her as a group and perhaps help her plan festivities that are more affordable for everyone. In reality she will probably appreciate the help. Step 4 – Wedding gifts. According to TheKnot.com, the cost of being a bridesmaid in 2011 averages around $1400. So, when you have already spent a great deal of money to be a bridesmaid in your friend’s wedding is it necessary to give a wedding gift? Yes, and no. Yes, if you have the means you should give a gift even if it is a small token of your affection. However, if you are already stretched beyond your limits, there is really no need to provide a gift. Two suggestions: give a small gift that is heartfelt, something they will absolutely love or provide a service for them as wedding gift; something like checking their mail or pet-sitting while they are on their honeymoon, which can save them hundreds of dollars. You need to respect yourself and be honest at all times. In the end, your friend will just be happy to have you standing by her side.